But analysts didn’t have high expectations. They were looking for $27.79 billion in revenue, a 7.5% decline, and 71 cents earnings per share from the year ago quarter. But revenue declined in nearly every business unit. So it’s hard to tell if the company has hit bottom yet. The last two quarters the company shocked the world with bad news. First it took an $8 billion write down of goodwill on its $13.9 billion EDS acquisition. Then it took an $8.8 billion writedown from its $11 billion acquisition of Autonomy, and accused Autonomy executives of $5 billion worth of fraudulent accounting. And prior to that HP offered up more bad news: it embarked on a massive multi-year layoff of just under 10% of its workforce, or 29,000 people. Q1 FY13 Q1 FY12 Y/Y GAAP net revenue ($B) $28.4 $30.0 (6%) GAAP operating margin $6.2 % 6.8 % (0.6 pts.) GAAP net earnings ($B) $1.2 $1.5 (16%) GAAP diluted EPS $0.63 $0.73 (14%) Non-GAAP operating margin 7.9 % 8.6 % (0.7 pts.) Non-GAAP net earnings ($B) $1.6 $1.8 (12%) Non-GAAP diluted EPS $0.82 $0.92 (11%) Information about HP’s use of non-GAAP financial information is provided under “Use of non-GAAP financial information” below. 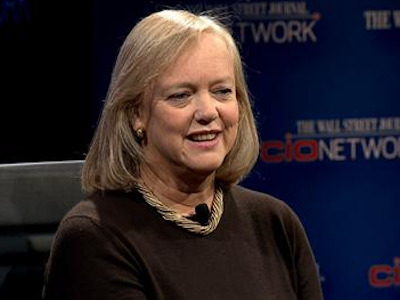 HP today announced financial results for its first fiscal quarter ended Jan. 31, 2013. First quarter GAAP diluted earnings per share (EPS) was $0.63, down from $0.73 in the prior-year period and above its previously provided outlook of $0.34 to $0.37 per share. First quarter non-GAAP diluted EPS was $0.82, down from $0.92 in the prior-year period and above its previously provided outlook of $0.68 to $0.71 per share. First quarter non-GAAP earnings information excludes after-tax costs of $373 million, or $0.19 per diluted share, related to the amortization of purchased intangible assets, restructuring charges and acquisition-related charges. For the first quarter, net revenue of $28.4 billion was down 6% year over year and down 4% when adjusted for the effects of currency. Personal Systems revenue was down 8% year over year with a 2.7% operating margin. Commercial revenue decreased 4%, and Consumer revenue declined 13%. Total units were down 5% with Desktops units up 10% and Notebooks units down 14%. Printing revenue declined 5% year over year with a strong operating margin of 16.1%. Total hardware units were down 11% year over year. Commercial hardware units were down 6% year over year, and Consumer hardware units were down 13% year over year. Enterprise Group revenue declined 4% year over year with a 15.5% operating margin. Networking revenue was up 4%, Industry Standard Servers revenue was down 3%, Business Critical Systems revenue was down 24%, Storage revenue was down 13% and Technology Services revenue was down 1% year over year. Enterprise Services revenue declined 7% year over year with a 1.3% operating margin. Application and Business Services revenue was down 9% year over year, and IT Outsourcing revenue declined 6% year over year. Software revenue was down 2% year over year with a 17.0% operating margin. Support revenue was up 11% while licence revenue was down 16% and services revenue was down 8% year over year. HP Financial Services revenue grew 1% year over year as a 1% increase in net portfolio assets was offset by a 25% decrease in financing volume. The business delivered a 10.6% operating margin.